Plastic has become ubiquitous in our home and work lives, but is a pollutant that won’t break down. Mushrooms may provide a sustainable alternative. Plastic has become ubiquitous in our home and work lives over the past 50 years. It is pliable, durable, easy to make, and hard to break. Plastic may be convenient and useful, but it also won’t break down naturally, which makes it a long-lasting pollutant. A recent study published in Science Advances found that humans have produced 8,300 million metric tons of plastic to date, which is 25,000 times the weight of the Empire State Building. Seventy nine percent of that has ended up in landfills or the ocean. If we continue making plastic at our current rate, that figure will reach 12,000 metric tons by the year 2050. Plastic pollutants are showing up in drinking water all over the world as well as in food products, like beer. We have a serious problem. Humans are “addicted” to plastic, says Gavin McIntyre, chief scientist and co-founder of Ecovative, a company aiming to reduce our dependence on plastic and other toxic or non-decomposable materials by making biodegradable alternatives. For several years, Ecovative has been manufacturing eco-friendly packaging supplies, and has just received a grant from the Environmental Protection Agency to further develop its new product, mResin, an alternative to the harmful adhesives found in most paneling and insulation. Ecovative products, unlike most synthetic plastics that are made from crude oil, are grown from mycelium—networks of fungal or mushroom roots. In nature, fungi break down waste, such as old leaves, dead plants, and pieces of wood, and use it to propagate. Ecovative harnesses this natural process and grows the mycelium into various shapes and structures, from pieces of furniture to packaging materials like MycoFoam, its trademarked Styrofoam substitute. 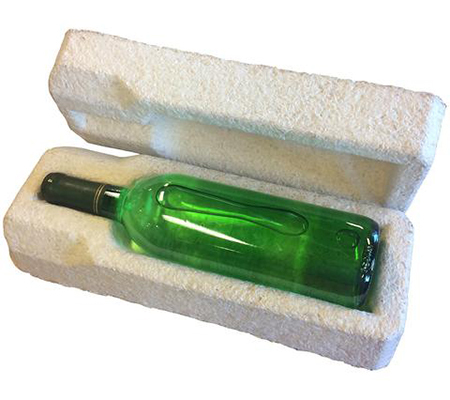 A wine shipper made of Ecovative’s mycelium packaging. The company’s operations are based on a fusion of applied biology and industrial-scale production. To grow its products, Ecovative buys wood chips or agricultural waste from regional farms and cleans the debris, creating a suitable medium for cultivating mycelium. The bits and pieces of agri-waste are then mixed and treated with mycelium, which digests the waste, enveloping it into a white, fibrous root matrix. The mycelium-coated particles are then broken up and sorted into trays that serve as molds, in which Ecovative grows its products. After a few days, the mycelium hardens into solid structures that take the form of their receptacles. Once this process is complete, the structures are dried out so that they no longer can form spores or mushrooms. The resulting material is nontoxic, naturally fire-resistant, home-compostable, and suited to a variety of applications. mResin is the latest development in the Ecovative line of products. With the use of a new device called the aerated bed reactor, Ecovative now is able to grow larger mycelium structures in a variety of dimensions and densities. For example, the start-up can now grow boards and is aiming to enter the market for doors and countertops. The idea is to phase out the role of formaldehyde, a carcinogen, in assembling products such as particleboard and most insulation. The EPA awarded Ecovative nearly $100,000 through its Small Business Innovation Research program for developing mResin. If it succeeds in commercializing it, up to $300,000 more could be waiting. “They were the first organization to take a risk on our first research into replacing plastic packaging like Styrofoam,” McIntyre said of the agency, which has awarded grants to his company in the past. 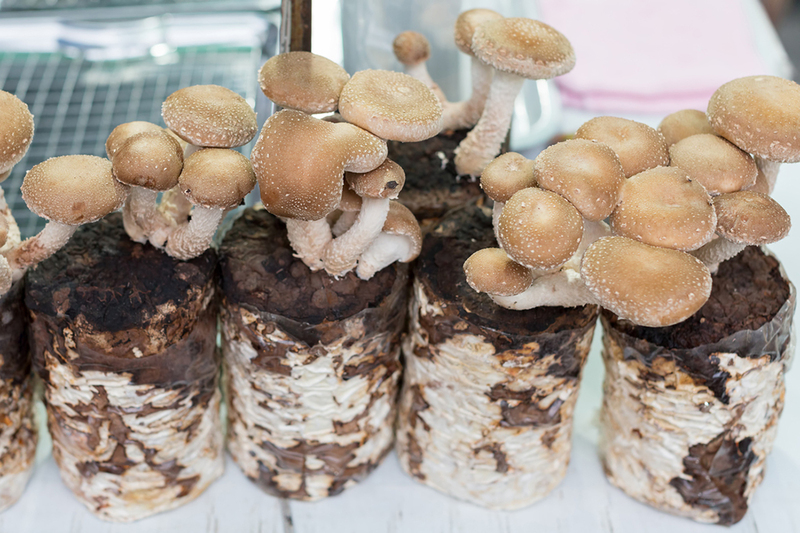 “We hope to leverage this new support to displace another toxic substance: formaldehyde.” The EPA‘s support has been integral to Ecovative’s bringing this mycelium-based approach to new markets. This latest recognition shows how a public private partnership can lead to a safer, more sustainable future. 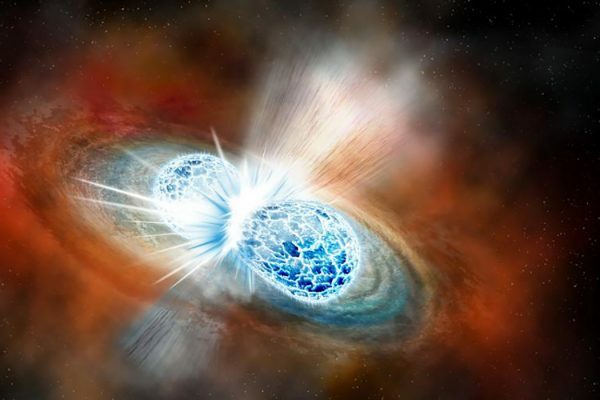 In the far off constellation of Hydra; two neutron stars collided, producing vast clouds of gold and other heavy elements. What's a neutron star anyway?